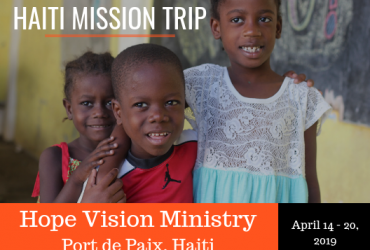 Hope Vision Ministry is an orphanage located in Port de Paix, Haiti that currently houses 43 children. Hope Vision is operated by Pastor Andy and his family. The children who make up Hope Vision Ministry range in age from new born to eighteen years old. Some children have come from the government while other children come straight from the streets that Pastor Andy has come to know. In 2000, Pastor Andy was given the vision of planting his first church. From this vision, First Grace Chapel Church located in Port de Paix, Haiti was established. Pastor Andy is the lead Pastor of Grace Chapel which currently has around 250 -300 Haitians worshiping the Lord every Sunday. Pastor also uses the church plant to reach out to other Haitian Pastors, and leads them in weekly prayer meetings. From this church plant we also saw the beginning of Hope Vision Ministry. Haiti Gospel Fund is dedicated to furthering the Kingdom of the Lord throughout Haiti by connecting pastors, ministries and churches in Haiti with those here in the United States. We seek those who want to come alongside and aid in the spreading of the Gospel through evangelism, church planting, orphan care, medical aid and truth of the Good News. This is accomplished by the partnerships of individuals, groups, and churches coming together to send teams to work alongside Pastor Andy and his team. Meet and get to know the Haiti Gospel Fund board of directors. Haiti Gospel Fund is a 501(c)(3) non-profit organization dedicated to furthering God’s Kingdom in Haiti.